These 4” square boxes with conduit knockouts are installed in walls or ceilings for lighting fixtures, switches, receptacles or other outlet devices. Square boxes are used to bring power to a number of electrical devices where mul-tiple conductor runs are split in two or more directions. 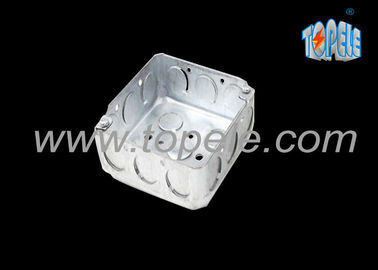 Field Names: 4S Box, 1900 box, 1900 electrical box, 1900 junction box, conduit box, J-box, concentric box, conduit junction box, outlet box, drywall mud box, standard 1900 box, square conduit box. TOPELE 4” Boxes can be surface or flush mounted when multidirectional conduit runs are necessary, These boxes include a raised ground provision.